The wave rose above me like a yellow wall of death. Time froze, weirdly, as every terrifying tsunami dream I’ve ever had flashed through my mind. “You have to jump into it!” Janessa yelled, and I closed my eyes and jumped into one of my biggest fears. The wave completely knocked me over, smashing my head into the pebbly beach. I got up, my lungs burning with salt water inhalation, and here was another wave, smashing into me again. Janessa, cool as a cucumber in the midst of the biggest waves I’d ever experienced, waded over and helped me up. I’ve always been afraid of big waves. I don’t know why. Growing up near the Pacific I’d gaze at the huge swells of water way out in the ocean, and a tight fear would grip my stomach. Maybe the wave would keep coming and coming, big and crushing and scary. But by the time it got to me it was always a tiny thing, icy cold and lapping at my toes. Sometimes my cousins and I would hold hands and wade deeper and deeper into the water, jumping the waves as they came. First ankle deep, then knee deep, then waist high. A few very large ones hit me in the face. But there was security in the chain of cousins. If I fell, they would help me up before the next wave hit. “You’ll just have to go see it for yourself sometime,” she said. And indeed, when I told her of my plans for an Eastern trip this summer, she told me that she was going to take me to the Atlantic. I still don’t know how the boardwalk doesn’t get covered in sand. However, Janessa said it was a “windy day” even though there was barely a gentle breeze, so maybe the fierce gusts of wind that sting your legs and bury your things in the sand just don’t happen on the East Coast? “Can’t we just set it over by that dune?” I asked. 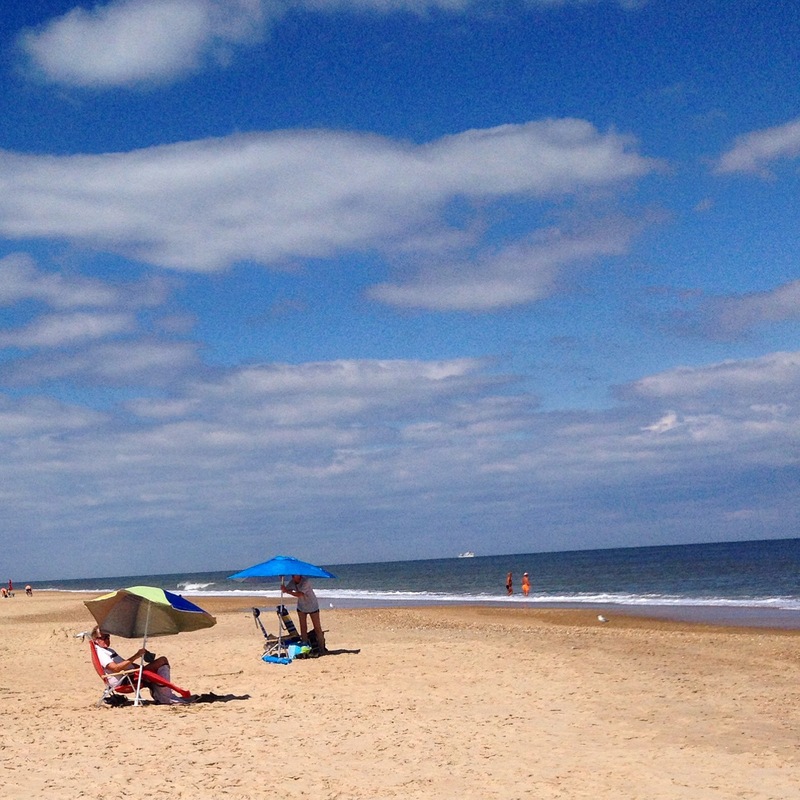 We staked out a spot amidst the other beach-goers, and I laughed, imagining doing that on the vast Oregon beaches. I don’t know where I got the idea that the Atlantic has tiny waves. The Atlantic just had one wave and it was huge, its vast bulk breaking right on the shore instead of comfortably far out in the ocean. I was terrified. But I really, really wanted to swim in the Ocean, and Janessa was wading in like it was no big deal. “We have to go out past where the wave is breaking if we want to swim,” she said. Finally, the mystery of how people swim in the ocean was solved. They go out PAST where the waves break. I was sure the water out there was going to be far over my head, but it wasn’t. “I can do this. I can do this.” I told my trembling body as the swells picked me off my feet and then gently set me down again before breaking between me and the beach. And then the yellow wall of death broke right over me, and I was at the mercy of the water, and I couldn’t do this after all. We later learned that a hurricane had come through that weekend, making the waves bigger and the beach smaller, and pebbly where it was usually sandy. Despite that, the water was perfectly safe for swimming in. I just didn’t know how to handle big waves. You have to jump through them, not into them. I watched people, trying to memorize their technique. “Um, yeah,” said Janessa, slapping her arm to dislodge an offending fly. Goodness. What else could go wrong? I started laughing, and she joined me. We laughed and laughed as the flies swarmed around us, biting faster than we could dislodge them, and I began pulling handfuls of pebbles out of my swimwear. We continued to laugh at the utter ridiculousness of it all. We thought there should be some grand life metaphor in that, somewhere, but we couldn’t find it at the moment. So we strolled down the boardwalk, and got ice cream, and enjoyed what was left of our beach day. 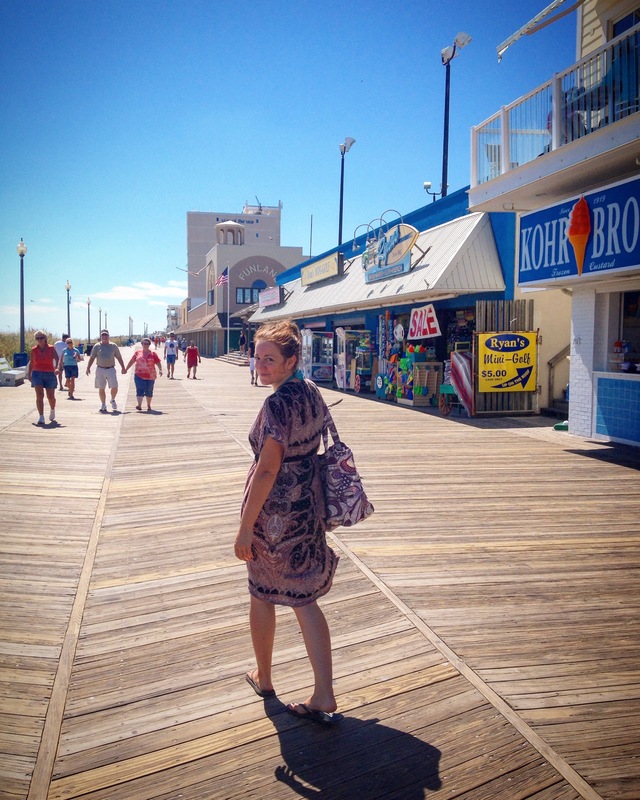 This entry was posted in Travel and tagged Atlantic, beach, boardwalk. Bookmark the permalink. So interesting! I loved hearing the two oceans compared. My sisters’ and my trick was to dive under the waves. The top part is fierce and strong, and underneath it is calmer water. So you just hold your breath and when the bubbly feeling overhead stops, you pop up into calmer waters. That said, i thought the east coast waves were harsher than the west coast. That’s what Janessa had in mind when she told me to jump into it, but I misunderstood and jumped up into the fierce part, haha.